We return to St Andrews in a much better place than when we last visited at the start of the year. That game, if you recall, came within 24 hours of the news of the failed U.S takeover. Needless to say things were at a low ebb that day. Upcoming trial dates in Greece aside, the contrast is stark. The thumping of QPR was as convincing as it gets for a post 2011 Forest side and all with Garibaldi Red at heart can hopefully begin to see the stamping of a philosophy on the club at board and pitch level. It will remain a steady and often frustrating climb but progress is something we haven’t seen for a long time. We should cherish it, not demand it hurry the hell up. Mark Warburton, I think, deserves immense credit for his long-term focus. Too many times we have seen managers being forced to look no further than the next game because of the ridiculous demands on success. I don’t blame them for it in truth; success at Forest for any manager in the last five years has been to survive in their job. Warburton has something more stable above him now but his approach is nevertheless refreshing. It’s brilliant to see a Forest manager remain unwavering in support of his players, as it is to see them given time to develop, improve and learn his methods. We’ll lose plenty of games this season but you get the sense we are growing at every turn. A decent sized group of us will be on a mid-morning train to Brum from Nottingham. Services depart twice an hour at 10 mins past and 41 mins past the hour so plenty of options to choose from. The 10.10 or the 10:41 seem the likely choices. Less than an hour and fifteen minutes later we’ll be in Birmingham. 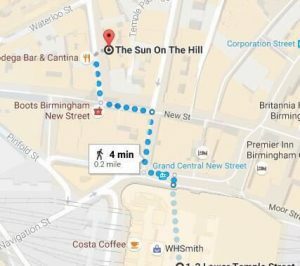 Leaving New Street station is a mission in itself these days but if you can navigate your way out past the endless coffee shops you’ll find yourself smack bang in the middle of the city centre, a brisk 20 minute walk from St Andrews. Hanging about in the city is a far better use of your time though – lots of choices for some pre-match bevvies and I’m not aware of many options close to the stadium. I’d suggest similar if coming in via car too. Something we’ve done a couple of times is to park just outside of the city at a station called Gravelly Hill which is just off the M6 Jct 6 / A38 junction (Spaghetti Junction) and pay £2.60 to get the train in to New Street and back. It’s not any quicker but a bit less hassle and you can find yourself straight into town after a ten minute train ride. Note it is only street parking at Gravelly Hill but there is plenty of it in the surrounding streets. If you’re on the train from Nottingham then it’s £18.90 return. Return trains are generally 19 and 49 past the hour. The first service back to Nottingham after the game is the 17:19 which you’ll make if you don’t dawdle. We’ll be hanging around for a while to soak up the bright lights of Brum. I’m a fan of the Sun on the Hill a couple of minutes’ walk from the station (over the high street and up the hill) and is often a starting point for many other Reds arriving into town it seems. The Shakespeare is even closer and is also worth trying. There are other odd pubs and bars I’m less familiar with to pick from but you might need to head a little further out of the centre of the city to find some other options. 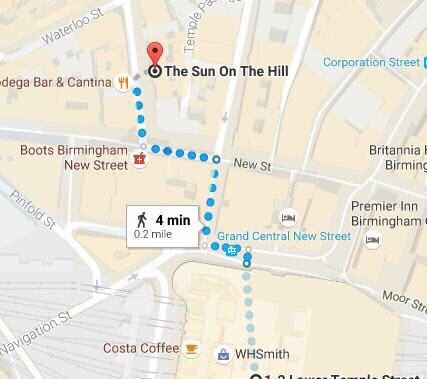 Broad Street is fairly close (left out of the front of New Street) and that has numerous places to try all the way down towards the Brindley Place complex of bars. The Frankfurt Christmas Market opens this Thursday (16th) and it’s highly likely we’ll end up there at some point. It ain’t cheap but it’s something different and the beer is spot on. It’s usually pretty busy too. Last season we spent pre-match in the Bierkeller / Shooters on Broad Street and climbed into a taxi at 2pm. The ground is walkable from there but you’ll be pushing 30 minutes or more. Incidentally, the Shooters that day was the birthplace of the ‘Party in the street’ song. The second half of the game also saw a constant 25 minutes wave of ‘All we care about is NFFC’ which was at least some way of letting off some steam following the takeover news. Of course, it was also the end of Montanier. An eventful day. The initial 2,500 tickets have sold out and a further batch of 300 has been allocated which probably won’t last long. Grab one if you can. If you are going then let Warburton and his team see your support at Birmingham and get yourself on the train and get some ale down you. See you there. And sing up! Warburton’s Red and White Army.